Most children in Essam, Ghana, had never seen a merry-go-round until a BYU-led team arrived to install the curious device in their village. For more than 200 children, the installation day was memorable: not only did they take the new toy for a joyous, dizzying spin—or two, or three—but they also lit up their school with kid power. 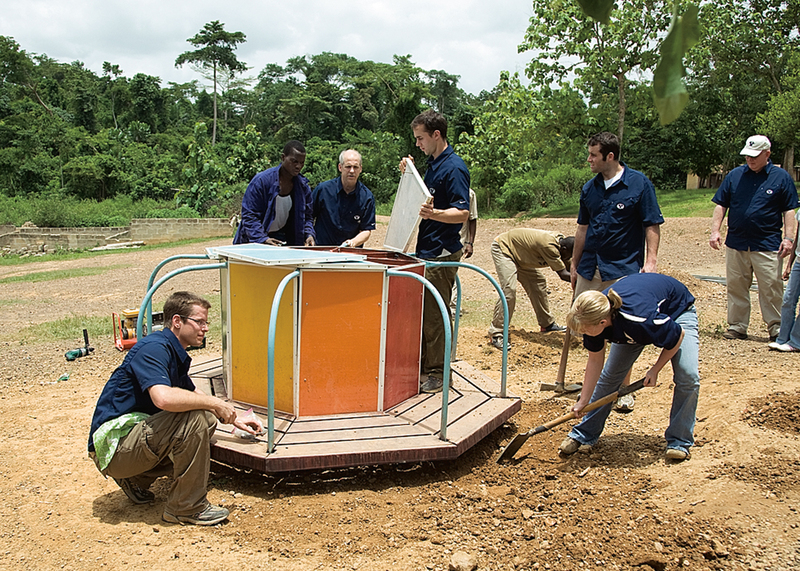 A team of BYU technology students installs an innovative power-generating merry-go-round in a schoolyard in Essam, Ghana. “As children push the merry-go-round, it will generate electricity that will light the school rooms,” says BYU’s Charles R. Harrell (BS ’76), associate professor from the Ira A. Fulton College of Engineering and Technology. 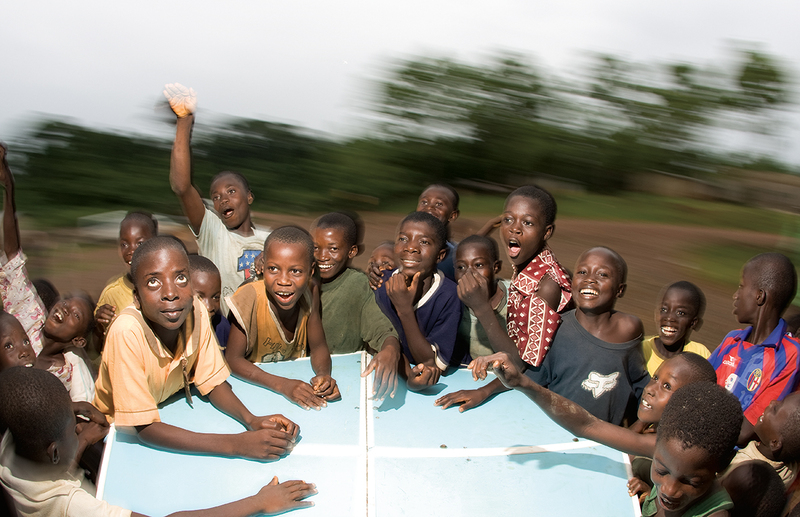 Harrell advised a team of five technology students who designed the device and then, with their Ghanaian colleagues, built and installed it at the Golden Sunbeam School. The Essam merry-go-round is the first to be installed in a village where there is no electricity. The power generated by the merry-go-round is stored in a car battery that in turn recharges several dozen portable LED lights that can be used in classrooms and homes. To make sure the toy was easy to push and fun to ride, BYU students used a gearbox to multiply the rotation speed and modified the circuitry to limit power drained from the system. 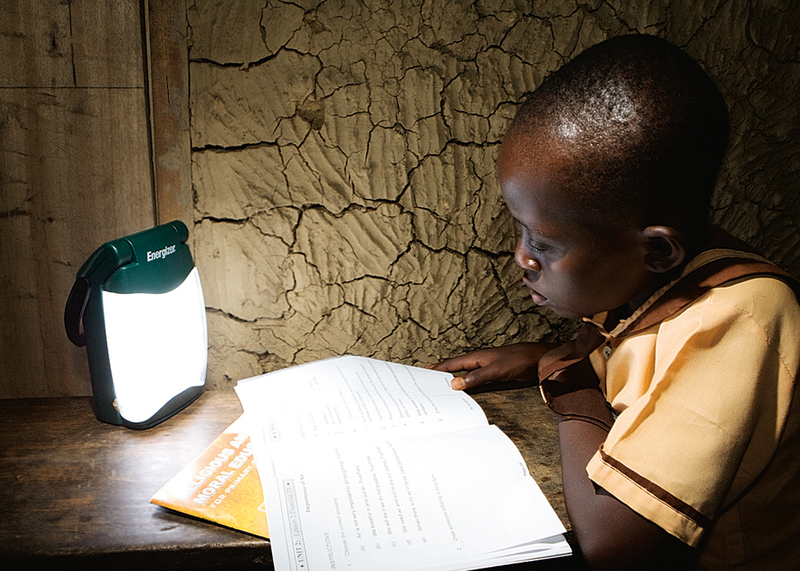 Students can use rechargeable LED lights in the classroom or at home–a benefit of power generated by having fun at recess. “This project will enhance education by providing power for lighting, giving children opportunities for fun and also giving them a hands-on science laboratory,” says project sponsor Ben S. Markham (BES ’71), founder of Empower Playgrounds. Ghana’s Ministry of Education has asked that six more merry-go-rounds be installed in 2008 to see if they can provide a viable power option for some 10,000 Ghanaian public schools that currently have no power source. Watch a video of the installation online at more.byu.edu/merry-go-round.